George Leonard Chaney : Surf Riding at Hilo, 1880. Source identified by Partick Moser: Pacific Passages (2008) page 326. 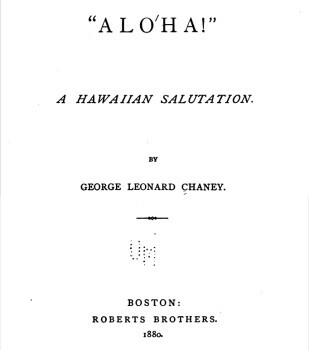 To omit from these pages the acconot of my excursion to the falls of the river Wailuku, and the description of the surf-bathing by the natives, would be like describing America and omitting Niagara. Not that the Wailuku Falls bear any comparison in size to the American lake-fall, but relatively to the island they are as large and interesting. The first of them is only two or three miles from Hilo, and is as easily reached as any thing can be which lies beyond the slippery, muddy, and uneven bridle-paths which pass for roads in Hawaii. Anuenue, the native name of this fall, or Rainbow Fall, in English, is unique among waterfalls. The entire river precipitates itself over a natural arch of basalt, and leaps a hundred feet into a green lake below. but these branches unite again before the lake is reached. The high cliffs on either side are decorated with ferns in plumes and streamers, and a dwarf growth of trees runs along their summits. The arch is as perfect as if made by hand, and under it, behind the falling river, is a deep recess filled with the shadow and spray of the descending water. It would be difficult to say whether the sense of form or of color is most charmed by this perfect gem, already set by Nature with matchless taste. Nothing purer in tint could be found in the beryl itself than the delicate green of the fall as it broke over the brown basalt rock, and the deeper emerald of the lake below only rivalled the jewel above in clearness and delicacy. Clothe the slender figure with snowy white, and let its floating drapery be interwoven with prismatic hues when the sun comes forth from his chamber in the skies, and if that splendid bridegroom can find another bride more worthy of him on the earth, I have never seen her. 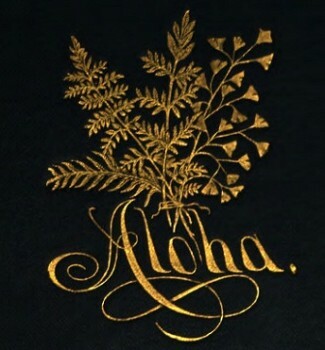 A visit to Anuenue is within the reach of every traveller to Hilo, at any and all seasons. But the trip to Puka-o-maui, the falls on the same river six or seven miles inland, and hidden in the thick of the great forest belt, is only feasible when there has been comparatively little rain, and the road is delivered of its floods and swamps. view of giving us this rare and delightful excursion. The clouds agreed with their kind intention, and one fine day in March our party started for a day in the woods and along the wild and variable course of the Wailuku. They were just sitting down to their noontide lunch, only waiting for our arrival to give the signal for beginning. 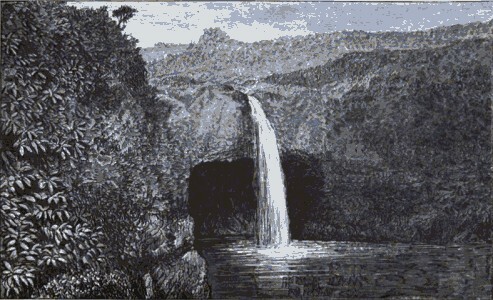 They had explored the remarkable bed of the Wailuku above the falls; had seen the singular cave into which its water flowed; had wondered at the temerity of the native swimmers who had dared to enter that darkness, with the river as their guide, taking the risk of coming out into the sunlight again in safety; had lingered on the brink of Puka-o-maui, and shuddered at its height; and on their way to it they had stopped, as we had, and seen the veil-like waving and lapsing of the river as it flowed in two widely separate streams down the face of a steep but not quite perpendicular cliff. rocks which disputed its passage to the sea. On our way home from the Natural Bridge, that afternoon, we left the beaten path once more, to see Pei-Pei Falls, and their peculiar surroundings. plunge of heavy waters; the others slender, trailing streams, lingering on the face of the cliff as they descend. The meeting of the waters in the pool below is concealed from view by a natural castle of rock, which stands midway in the river-bed and guards the pass. Lesser blocks of lava rock are thrown in admirable confusion up and down the stream, and we sit on one of them and look up the river to the falls, or down to the green pools which lie below. Among these pools are some which are called boiling pots, because they resemble great caldrons with water in full ebullition within them. They are natural pits in the bed of the river, connected with each other by hidden conduits below the surface. Their connection is clearly proved by the reappearance in the pool below of whatever is dropped in the one above. which Anuenue robes herself before descending to the sea, — would make a magnificent study of the manufacture of Nature. I had heard and read so much of the skill of the natives in swimming and their perfect domestication in the sea, that I very much wished to see some exhibition of their aquatic accomplishments. Our friends from New York came home one evening from a walk to the rapids of the Wailuku, much amused and astonished at an incident in their walk. had met a native man and woman on the shore, who, like themselves, wished to make their way home. But instead of taking the toilsome way overland, these accomplished travellers quietly embarked upon the river, and shot the rapids as if they had been fishes. There is a point on the river sixty or seventy feet above deep water, from which men leap into the flood below. were all eager to attend. Promptly at eleven we went to the wharf. A large party of Americans, chaperoned by Mrs. A. L. Stone of San Francisco, was there before us. Officers of the " Myrmidon," the British ship in which Governor Dominis had come to Hilo from Honolulu, were also in attendance. 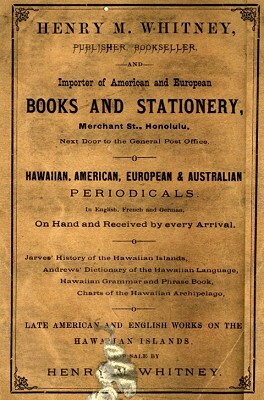 The entire commercial and trading population of Hilo was out,— a matter of three or four store-keepers and their clerks. lip just opposite the mouth of the Wailuku River, and then gradually break into a broad, good-natured laugh, running all along the curving beach beyond the little pier. If a skilful surf-bather can get his board to the front, where the roller first begins, and keep it just on the edge of the advancing wave, he will be carried with increasing swiftness on to the final break-up of the sea in the surf upon the shore. A very slight maladjustment of the saddle on these watery coursers will unseat the most accomplished rider. Again and again, amid shouts of laughter from the native crowd on shore and unnecessary sighs of anxiety from the uninitiated foreigners, these surf-riders were upset and submerged in the rushing waters. Hardly would they disappear before their shining heads would come up again in the rear of the wave that had thrown them, and they would push out further into the sea, to mount the next convenient roller. They rode their surf-boards as boys coast downhill, flat upon their faces, and seemed to keep themselves in place by a timely stroke or hold-fast of their hands. The toil of swimming off with their big boards after each ride, and beginning again, would have spoiled the sport for less easy swimmers. As in coasting, one needs the excitement of a rapid descent to sustain the labor of returning to the starting-point ; but to these natural swimmers it was all sport. the perils of the shore with those of the sea, declared that in case of an accident on land, "There yon are," but on the sea, "Where are you?" was no dilemma to them. Under water or above it, was equally home. And when their run was a success, and prone on their shooting rafts they came swift as an arrow shot from a bow, in one triumphant rush, from far away, almost to the rocks at our feet, it gave me a new sense of the beauty and worth of physical perfection. "Punch " says that, in case of accident, " absence of body is better than presence of mind." But there is such a thing as bodily presence which can almost defy accident. These men are displaying it this very hour. See that man on his surf-board coming in on the perilous edge of the wave. He is actually standing upright on the tottering chip beneath him. With arms outstretched and body held in perfect poise he comes, fearless of fall, because equally ready for every issue of his venture. The water seems to confess him as its master, and carries him with a proud docility like a well-broken horse. The crowd watches him with breathless interest. Some of them know the difficulty of that ride. Nearer, nearer, he comes, riding the surf from the beginning to the end of the course, and then leaping, with the grace and freedom of a circus-rider, into the deep, and swimming, amid the plaudits of the spectators, to the shore. rocks to the shelter where they have left their garments of civilization, and the show is over. The audience slowly and contentedly retire. Again, at the governor's mandatory wish, some natives climb the coco palms that overlook the pier, and throw down cocoa-nuts for our refreshment. 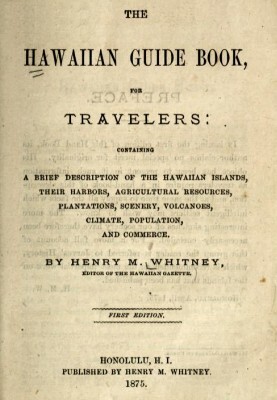 Honolulu, Henry M. Whitney, 1875. Geoff Cater (2013-2017) : George Leonard Chaney : Surfriding at Hilo, 1880.